An Air Malta flight has landed safely at Glasgow Airport after fears that one of its tyres had burst. 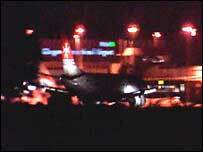 The Boeing 737, with 143 people on board, took off after 1930 BST and circled the airport for three hours to burn fuel before attempting to land. The British Airports Authority (BAA) said full-scale emergency procedures were activated. Emergency services on-site were backed up by fire and ambulance crews from the Strathclyde area. The crew reported a suspected problem with a tyre when Air Malta Flight KM197 took off at 1936 BST. An Air Malta spokesman said the crew followed "standard procedure" after suffering loss of pressure in the tyre. He said: "It is not hugely common but it is not uncommon either. "There was still a good tyre on the main landing gear and the pilot was able to land safely according to standard procedure. "The crew are well trained for such incidents and we are always pleased that they carry out their duties accordingly." A BAA spokesman said the passengers had been through a frightening ordeal but no-one was physically hurt. He said: "These guys have been through a difficult experience. They have been through a trauma." The passengers were taken off the aircraft and escorted to a secure area at the side of the airfield. No-one was reported to be injured. They were all offered accommodation at the nearby Holiday Inn overnight and are awaiting an alternative flight from Air Malta on Thursday. There was relief among the stranded passengers as they filed into the international arrival hall after the aircraft landed. George Hutchison, 57, from Penicuik, who had been going on holiday for two weeks with his wife, said: "When the plane took off it shuddered and within five minutes it wasn't gaining height. "We cut back on power after 10 minutes. Things go through your mind like you might never see your family again, and when they started talking about the evacuation chutes, it really hit home." Mr Hutchison said the passengers broke into applause when the plane finally landed. "We were just glad to be on the ground," he said. Colin Walker, 29, and his new wife Joy, 28, from Bangor in Northern Ireland, had boarded the connecting flight to Malta to go on their honeymoon. He said: "The passengers had been told to go into the brace position for the landing. "It was a really rocky landing - the worst I have been on. "My head was against the seat in front of me. I just wanted the plane to stop. "It seemed like it was going on for ages. I was just overcome with relief when it stopped." Strathclyde Fire Brigade had sent eight fire engines, a turntable ladder, a heavy recovery vehicle and technical support units to assist the on-site airport crews during the incident.